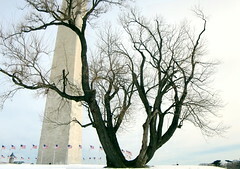 Over on DC Metroblogging, I have a few questions about the Washington Monument Tree. The photo I’m showing off in that entry is actually a stitched panorama of three vertical photos side by side. Funny thing is, I didn’t realize until after I had uploaded it that I had taken a somewhat similar panorama of the Washington Monument Tree just over a year ago, on a similarly snowy day. Anyway, anyone who might have inside knowledge of the history of that particular tree, you’re quite welcome to add that knowledge to ours over here.